Whilst academics may reflect on the nature and validity of concepts by analysing their evolution in discourse, planning practitioners possibly reflect less deeply on the terms and concepts we use as daily professional currency. Yet those of us who work across different administrative jurisdictions are often bemused by the subtly different meanings of such basic terms as planning, regeneration, renewal, development and urbanism; not to mention the divergent interpretations of finely crafted concepts such as spatial planning, sustainable development, or new urbanism. Frustrated at being manipulated by the definitional drift of ministers or civil servants (for instance, from renewal to regeneration as 1980s PR spin) or the interpretive hair-splitting of lawyers, practitioners are equally apt to distort concepts and principles to suit their own ends – whether working for authorities or particular development interests. For instance, sustainable development has becomes a justification for overdevelopment at a station – even a bus stop – and alternatively an argument for contextless techno-gimmick architecture. We have been in need of an honest compendium of terms – crystallising the currency of our trade at this point in time. 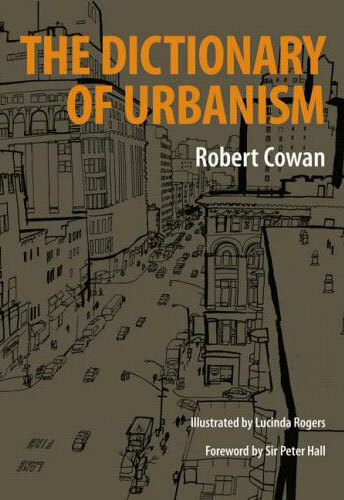 Well, now we have it – and so much more – with Rob Cowan’s excellent Dictionary of Urbanism. It combines a historical and geographical inventory with a bluffer’s guide to all forms of jargon. Indeed it is Cowan’s attempt to challenge George Steiner’s proposition that ‘the proliferation of mutually incomprehensible tongues stems from an absolutely fundamental impulse in language itself’. Urbane, witty and distinctively illustrated by Lucinda Rogers, it captures and distils terms, ideas, concepts and people from the past and present. It is not merely a listing however, but a networked collective which positively expands one’s boundaries. We may know what a Potemkin village is, but what of fatto urbano, zenobia or the city of Ys? That it crosses the different disciplines involved in urbanism, providing insights into many important personalities who may have influenced the course of thought and practice. Although planning-rooted along the dual axis of Howard-Osborne and Geddes-Mumford, it reaches out to explain architectural, transport and construction terms, and even a few curios like taylorism, birtway and regenbabble. Although not academically biased it helpfully spans, and frequently connects, theory and practice being usefully clear and concise in the explanations of, for instance, space syntax, smart growth and digital city. Overwhelmingly Anglo American in its content, the dictionary also draws from well beyond that easy London-New York-Chicago axis, taking in concepts, terms and personalities from mainland Europe, notably Germany and Italy, as well as Russia and India, for instance. For an ‘English’ book, Scottish terms and experiences are unusually well represented, although Africa, Australasia, South East Asia and the Hispanic world are perhaps under-represented. The dictionary has humour, even an occasional smugness, especially in subtle criticism through faint praise. The wow factor and non-place urban realm get this treatment, while the humorous dress sense entry would make an illuminating feature all on its own. The fascinating range of entries Rob has included in this Dictionary makes one wonder what he left out and why. In theory and philosophy Habermas, Healey and Faludi are included, yet there is no place for Castells, Harvey or Sandercock. From Newcastle we have T Dan Smith but no Richard Grainger, and from Merseyside we have Kirby and Brookside, but no Runcorn or Knotty Ash. From history, we have references to bastide and baroque towns, but no entry for Hellenistic or Roman urbanism. Perhaps the key lesson from this work is that technical language is important yet ever-changing, and can only ever be represented as a crystallisation of the outlook and usage norms from a particular age and culture. Ideally, within this dynamic the terms we use should enable clear interpretation and, to help with this in the constant flow of language and professional activity, we need specialist works just like this. It is an ideal desktop companion for our times, and even a good bedtime read. Hopefully it will be updated and expanded in the years to come. ← Planning is mental. Absolutely.